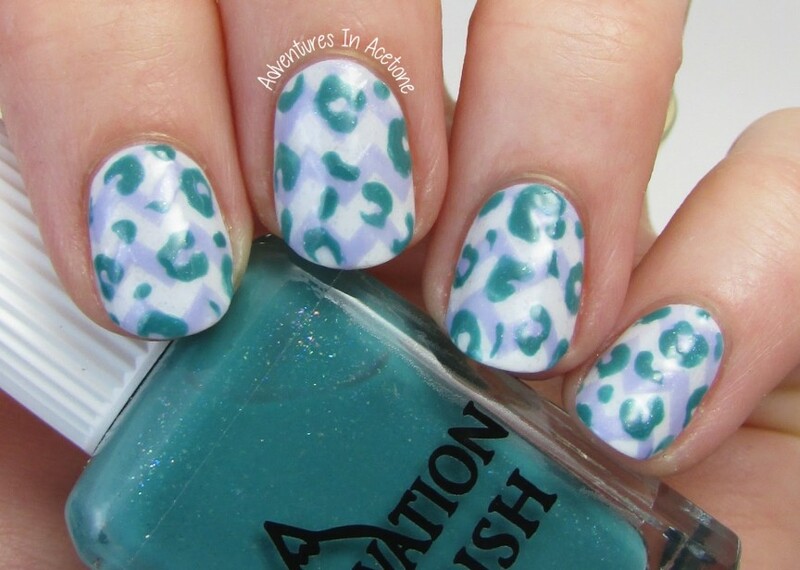 The Digit-al Dozen DOES Patterns On Patterns, Day 5: Chevrons and Cheetah Print with Elevation Polish! Good afternoon, readers! TGIF! It’s the final day of Patterns on Patterns Week with The Digit-al Dozen and I am really enjoying my final design! I used three shimmery Elevation Polishes, some chevron nail vinyls from KBShimmer, and a dotting tool to create freehand cheetah spots. I started out with 2 easy coats of my new favorite white: Elevation Polish Yeti Hugs: Feel So Close. This was a limited edition from January so you wouldn’t be able to get it on the site anymore. I’m already regretting not getting a second one. It has gorgeous shimmer in it. One coat of KBShimmer Clearly On Top was used to speed up the drying process before adding nail vinyls. Once I was certain the base was dry, I applied the connected chevron nail vinyls from KBShimmer. They are so easy to use because they are one piece for the entire nail and there is no frustration with getting the spacing even, and it peels all of the chevron stripes off at one time. One nail at a time, I painted a coat of Elevation Polish Atop A Ferris Wheel (this was also a limited edition polish. From A Box, Indied in July so I apologize for enticing you with something hard to find at this point). Before moving onto the next nail, I peeled up the chevrons while the purple was still wet. After I completed all of my nails with the chevrons, I used a dotting tool dipped in a puddle of Elevation Polish Theo Wirth Parkway (guess what? this one is brand new this month so it should be around a while for you!) to dab some cheetah spots over the entire nail. I did squiggly C shapes and some dragged dots in between. Once I was happy with the coverage, I added 2 coats of KBShimmer Clearly On Top to seal in the design and try to level out the layers. It’s still not completely flat on the surface but close! What do you think? I’m really digging it and am excited to wear it as a full mani for the weekend. I was worried that the double pattern would be overwhelming, but I think the mellow chevron colors are a muted background to the darker spots. Thanks so much for reading! Have a great weekend! I love the colors that you used for this, and I agree, it's not too overwhelming! Damn you, I want that white now! I really like the purple and teal together. You've successfully merged my favorite patterns and colors! This is perfection! Now I want that white…grrrrr! Interesting use of colours; I wouldn't think they work well together, but they do! This is so fun and I love the colors you chose! I really like the bold leopard over the subtle base. Mmm I love this! The colors, chevrons and leopards…I love it all! This is an awesome color scheme, and the design turned out perfect!